Okay sure, you’re going to have to start sloshing around liquid nitrogen to be able to get the Ryzen 7 2700X and Ryzen 5 2600X chips to top 5.8GHz, but that’s still a pretty good start for AMD’s second generation Ryzen processors. LN2 might be beyond your reach, but these are the best liquid coolers around today. 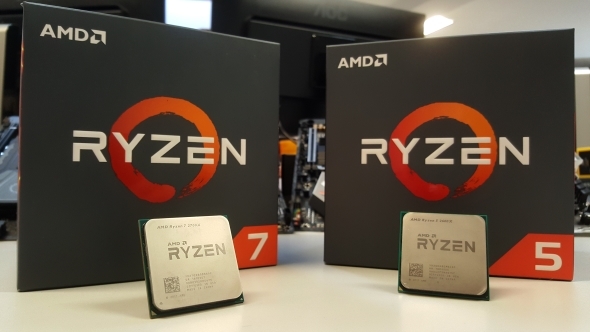 The new AMD Ryzen 2 processors are set to launch on Thursday April 19 (just a few days away, people), but don’t expect to be hitting near 6GHz on your home rig unless you have access to copious amounts of LN2. 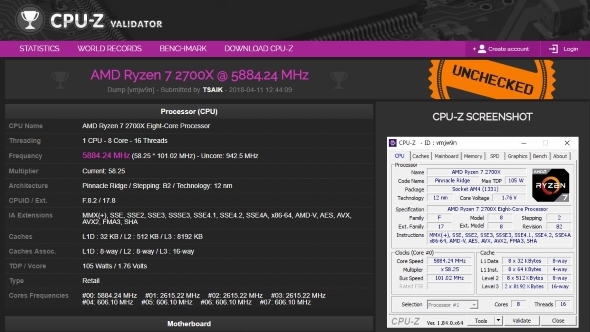 The two overclocks were reported on Videocardz with the scores appearing on the CPU-Z Validator site. The Ryzen 7 2700X is running with a BCLK of 101.02MHz and a multiplier of x58.25. That gives the eight-core chip a clockspeed of just under 5.9GHz, though it’s not clear if that’s just with a single core running at that speed or all eight. I’m guessing that simultaneous multi-threading (SMT) will probably have also been disabled to get a frequency that high. The Ryzen 5 2600X isn’t far behind, with a BCLK of 101MHz and the same x58.25 multiplier offering an overall frequency less than 2MHz slower than its bigger sibling. These aren’t the highest frequencies Ryzen processors have ever posted – the Ryzen 5 1600X has topped 5.9GHz in the past – but considering we’re still in the pre-release window that’s not a bad start for the new chips. Sadly I don’t have the chemical experience to get on the liquid nitrogen fun bus when it comes to testing our own Ryzen 2 processors, but we’ll have all the gaming-relevant scores and performance numbers when our own reviews go live on Thursday.